This documentation is a step-by-step guide to help you install your theme properly, configure its options and import the demo theme content. You’ll also find instructions and tips on using the various theme features. Please read this documentation thoroughly and use it as a reference while you build your website. WordPress is a website content management system (CMS) that you can use to create a beautiful website or blog. WordPress is both free and priceless. You need to ensure you have successfully installed the latest stable release of WordPress prior to installing Salbii. 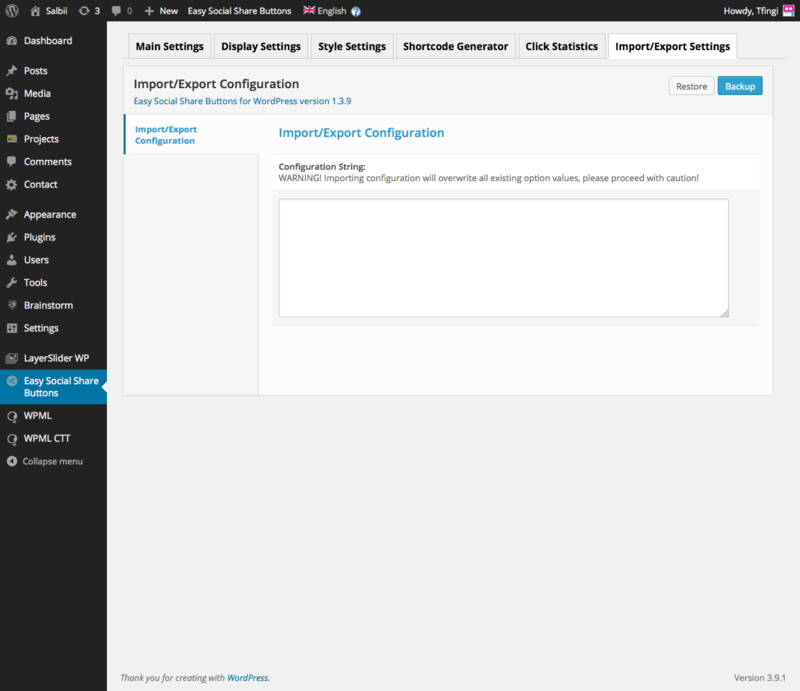 Our support team is unable to offer you support related to WordPress and/or third party plugin installation. Any faulty installation may cause Salbii to malfunction! If you are new to Salbii you may find it useful to import the content from the salbii.com demo website into your website. This is done by importing the XML file that was included in the zip file you downloaded from Themeforest. Note: If this is the first time you have used the import tool you may see a window to install the plugin – install the import plugin and proceed to the next step. 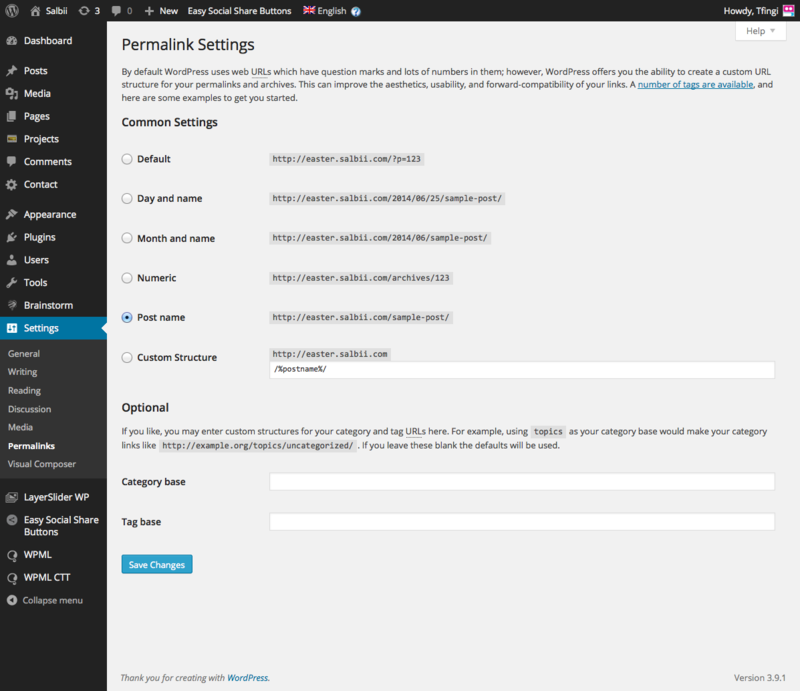 If you are new to WordPress, or would like to see how we created any of the elements on our demo website, you may prefer to import our demo content. However, if you are ready to start setting up your website, the information below will help you set up many of the basic functions. Note: When Salbii is activated a few initial pages are generated automatically to get you started – these are for the home, blog and portfolio. For more information refer to the Page Editing Basics section. If your links look like salbii.com/?p=123 you can easily change this to salbii.com/my-awesome-page. Note: Scroll to the bottom of the screen to see if WordPress has given additional instructions for manually creating a .htaccess file. WordPress will only ask you to do this if it wasn't able to create the file itself. 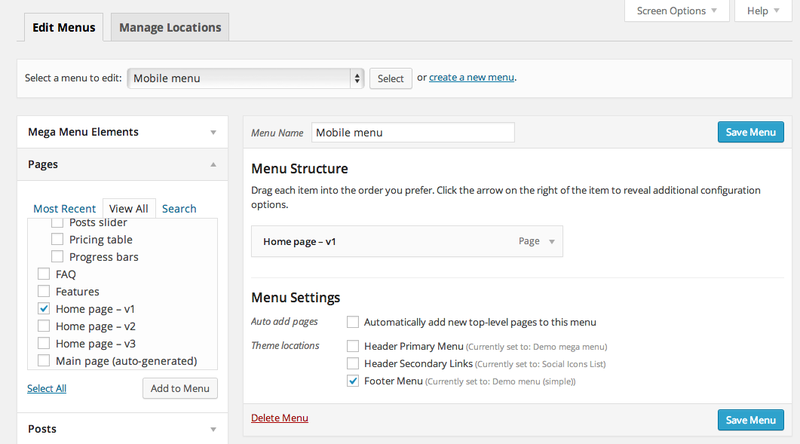 Menus are managed in the usual way in your WordPress admin by going to Appearance > Menus in the side navigation menu. If you are not already familiar with WordPress menus there is a guide to using menus on the WordPress website. Salbii has three set locations where you can display a menu: header, the footer and the top bar (the bar at the very top of the site above the site header). The mobile menu is created separately from the main menu. Please refer to the Mobile Menu section below for instructions on how to set this up. A mega menu is similar to a normal menu but adds a number of additional options including: columns, headings, images and shortcodes. For an example of what is possible with a mega menu take a look at the 'Home', 'Elements' and 'Contact' drop-downs in the main navigation menu on www.salbii.com. The Demo content section of this documentation includes instructions on how to setup the mega menu from the salbii.com demo website. 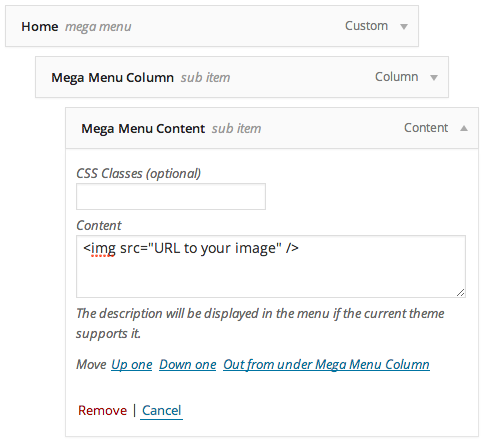 Note: Mega Menu items are only compatible in the Header Primary Menu menu location and will not work in the footer, mobile or top bar menu locations. Make sure 'Mega Menu Elements', 'Link Target', 'CSS Classes' and 'Description' are all enabled. You can now add new Mega Menu Elements from the section on the left. Note: You can use plugin shortcodes in a mega menu! The mobile menu uses a separate Mobile Off Canvas widget area, meaning you can create a different menu just to use on mobile devices. The social media icons in the top bar of Salbii are organised in a menu called Social Icons List. If you would like to remove this, you can do that in the top bar section of the Theme Options panel. 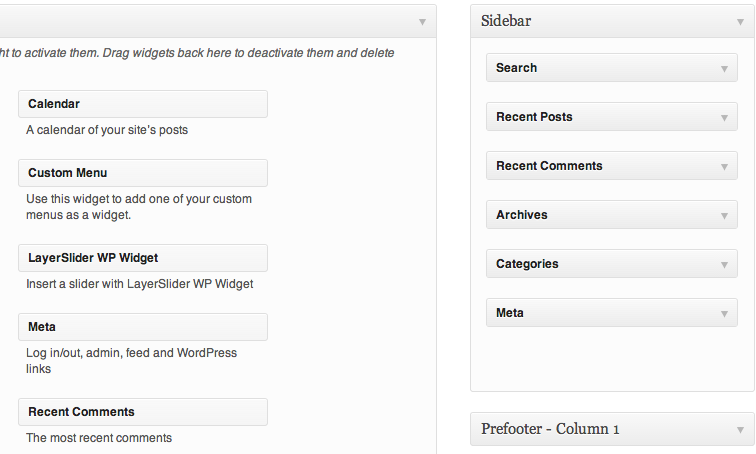 In your WordPress admin navigate to Appearance > Menus in the side menu. Make sure 'CSS Classes' is enabled. To remove an item from the menu, click the small grey arrow next to the item and click Remove. To link icons to your social media pages, click the small grey arrow next to the item you would like to update and change the URL field. First look on the complete list of icons for the name of the icon you would like to insert (e.g. 'icon-facebook' or 'icon-twitter'). In the left column click the Links heading to begin set up a new custom link. In the URL field enter the URL you want the new icon to link to. Some elements in Salbii make use of the Icon Manager plugin. If you imported the Demo Content you will find a selection of over 1000 icons already uploaded. If you did not import the demo content you can upload your own icons using the IcoMoon app. It is worth noting that some elements that contain icons do not use these icons (such as the icon box). These icons are entered using their html codes (e.g. &#xe000;). These icons may also be edited. 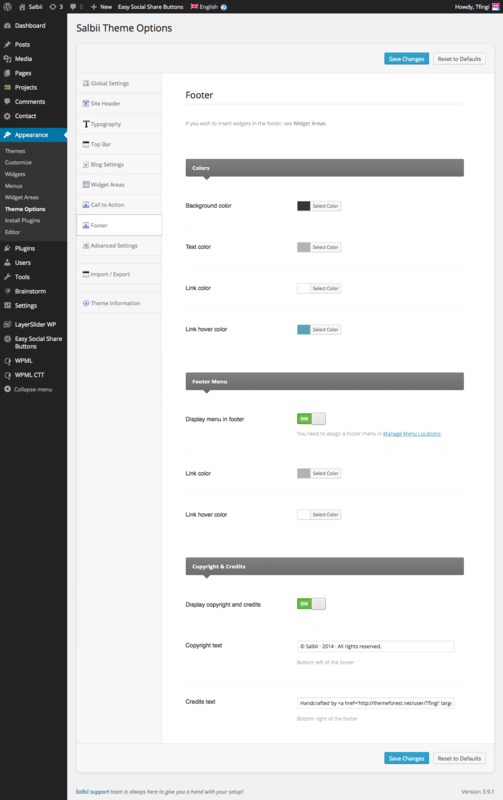 Pre-footer and Footer widget area sections can be switched on (or off) in the theme settings and can be configured to consist of 1, 2, 3 or 4 widget areas/columns. To manage your widgets navigate to Appearance > Widgets in the side menu. On the left side of the page are all the available widgets, while the right side lists all the available locations where widgets can be used. Click any of those locations to see what widgets are currently in use in which location. To insert a widget into a location, simply drag the widget from the left side into the location on the right. Once on the right side, you can click a widget to see and change its options. 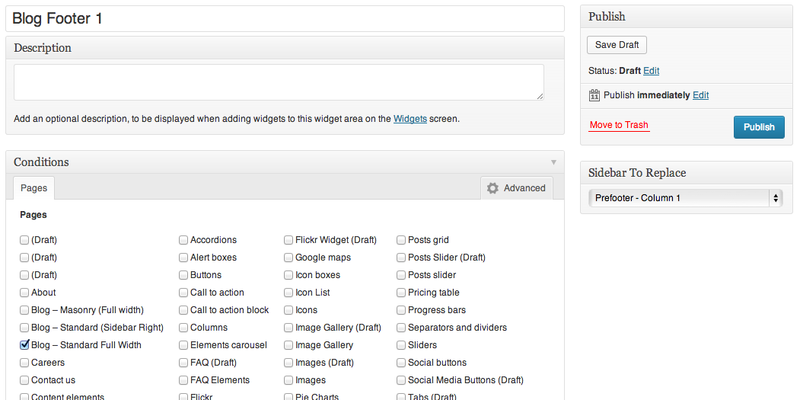 More information on using and activating widgets may be found on the Wordpress tutorial. If you would like to override the default widget areas and display different widgets in your footer / sidebar on specifics pages of your site (i.e. 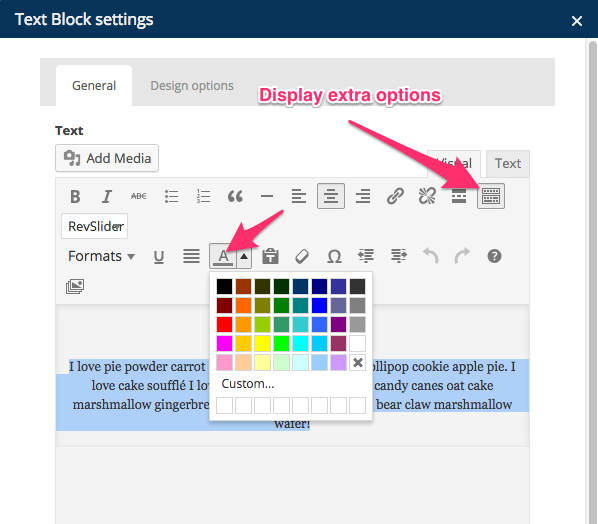 your blog), you may do so using the Widget Areas panel. Note: Once you have created a new widget area you will need to go to Appearance > Widgets to setup the widgets you would like it to contain. 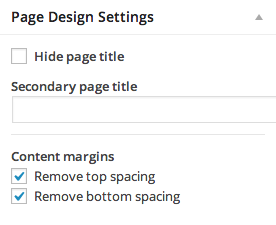 Note: If you are unable to locate the 'Page Design Settings' panel click the small Screen Options dropdown at the very top of the page and make sure Page Design Settings is selected. 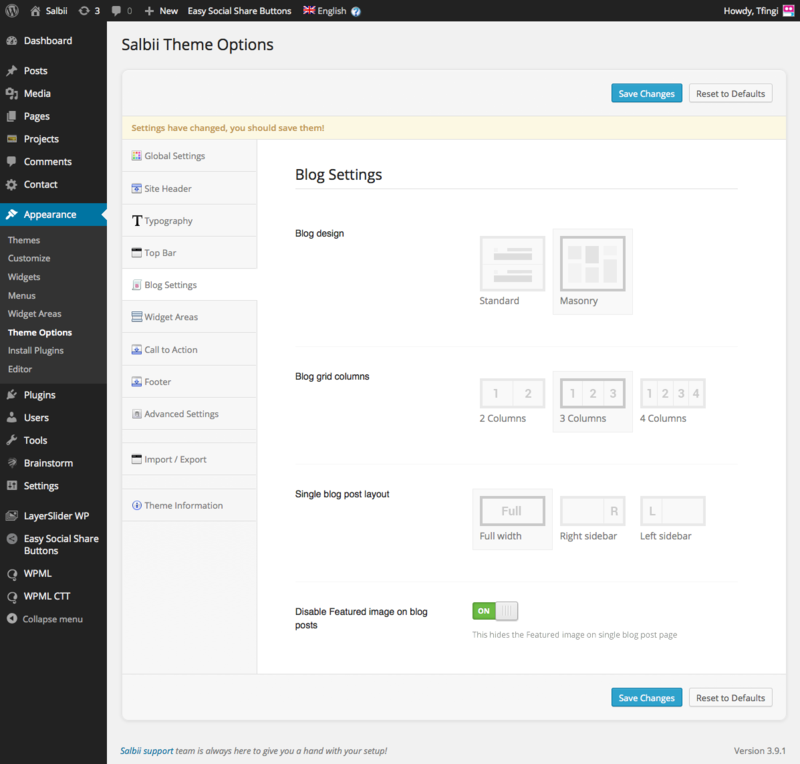 Salbii pages have been created using Visual Composer – a plugin that provides an intuitive drag-and-drop interface to the WordPress page editor. Making it possible for you to easily layout and edit pages in WordPress without any knowledge of code. If you are unfamiliar Visual Composer, find out more at vc.wpbakery.com. 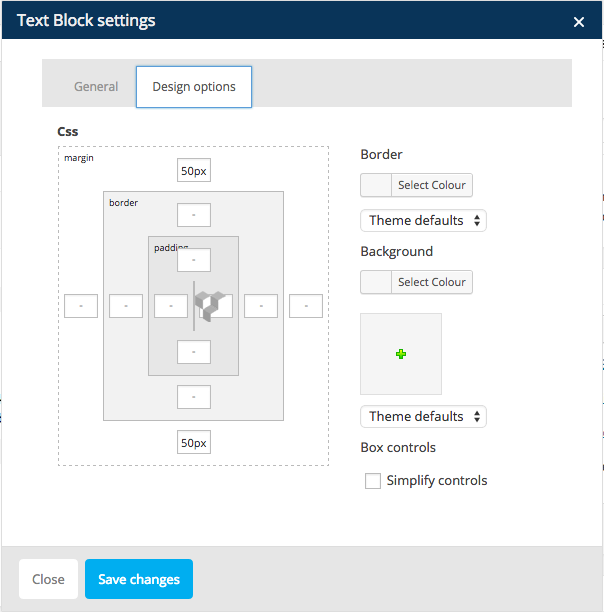 Note: If you haven't already done so, you should make sure Visual Composer is setup to work with all content types by going to Settings > Visual Composer and selecting all of the listed Content types. When editing a page make sure the Backend editor button just below the page title is selected. Page content in Visual Composer is divided into horizontal sections called Rows (you could think of these as shelves in a book store). Full width sections are also commonly referred to as Out of the Box sections – because the extend outside the width of the column that contains the page content. If you would like some content to be full width (such as a LayerSlider banner or separator) – you will need to click the pencil item for that row and enter extended-row into the Extra class name field. 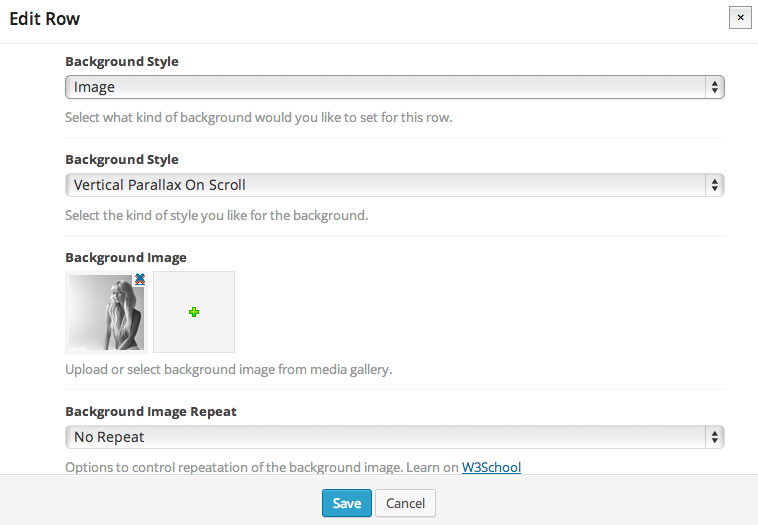 Fixed background are created in the same way as Parallax sections. 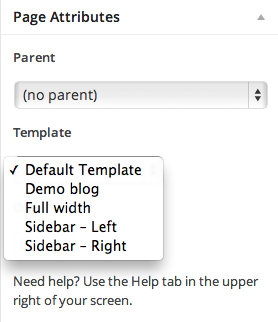 In the LayerSlider ID dropdown menu select your LayerSlider and click Save. 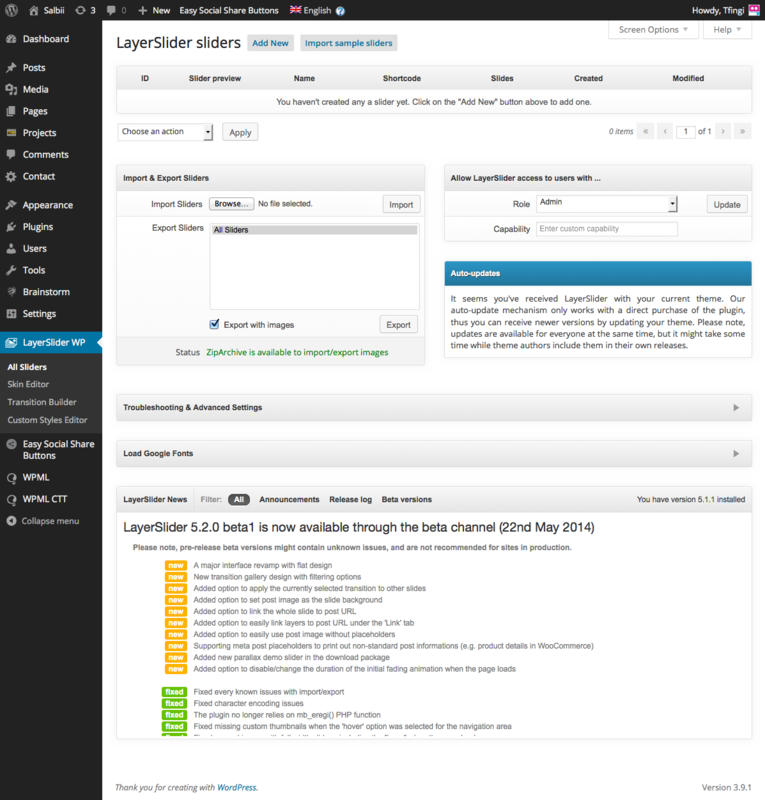 You may notice that the LayerSlider isn't showing the correct banner on the page (typically after importing demo content), please ensure that the correct banner is selected in Step 8. There are four ways to create a Call to Action block. The best method will depend on your needs. Method 1 will set up the site wide Call to Action that is placed just above the footer. Method 2 will set up a Call to Action block that is column wide like shown here. Method 3 and Method 4 will set up a Call to Action block that is full width and may be placed anywhere. 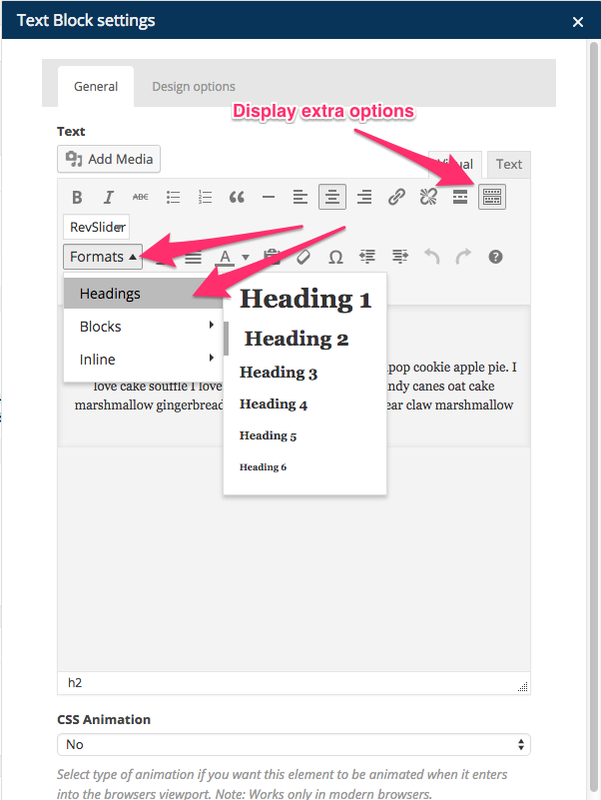 Rows, Columns and many Elements have individual overrides for their spacing. If you would like to adjust this you can do so in their properties. 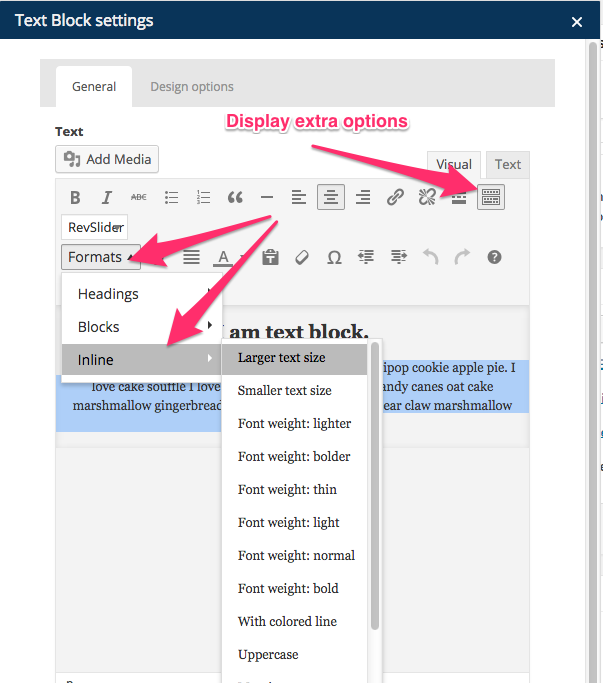 There are six heading options that range in size for your headings and sub headings. You may select any colour for your text. There are many different styles to customise your text. The 'Theme Options' page is where you can customise the options provided by the Salbii theme. The top bar is the optional bar/area at the very top of your website above the site header and is split into two editable sections ('left' and 'right'). 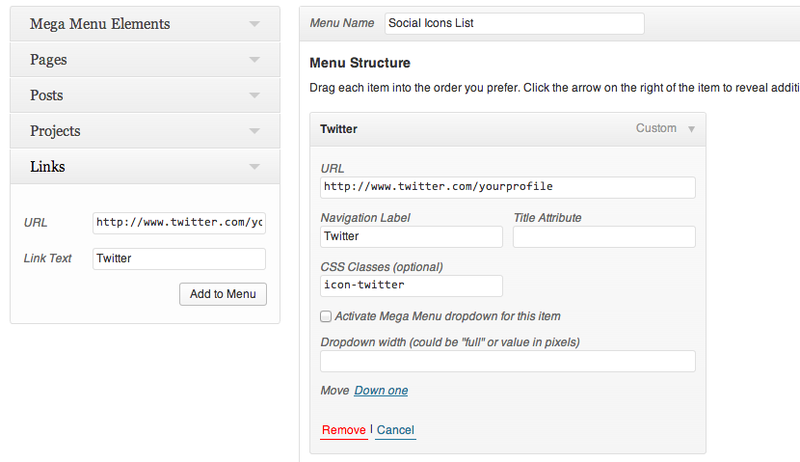 Both of these sections allow you to insert a menu, or social media icons or your own text. Menus should to be created as normal in Appearance > Menus. If you use the WPML language plugin on your site, you have the option of displaying your language switcher in the top bar. Single post pages can be displayed full width or with a sidebar on the left or right of the page. You can also choose whether or not to display featured images. Salbii provides the option of a full-width section above the footer to include a call to action. An example of this can be seen in on our demo site at www.salbii.com. This is where you can enter any Custom CSS that you would like to override Salbii's default styles. Note: It may sometimes be necessary for you to include the !important attribute to override some styles. The Custom script section is where you can add custom scripts, e.g. when using Google Analytics. The changes you make in Salbii's theme options are saved in the WordPress database. There may be times where you would like to be able to export your theme options settings to a text file to keep for backup, or for you to import into another installation of Salbii. Something is broken, please can you fix it? How can I update Salbii? Why can't I import the demo content? How can i increase the WordPress memory limit? Why is there a message that reads: "Warning: getimagesize():" in my WordPress admin and next to my logo? When I install Salbii it gives the error: "Broken theme and/or stylesheets missing", is this something wrong with the theme? What is a child theme and do I need one? Things can break for all sorts of reasons, but there is a simple list of things to do that can fix all issues. Ensure you are using the latest version of Salbii (often we have already fixed the issue). 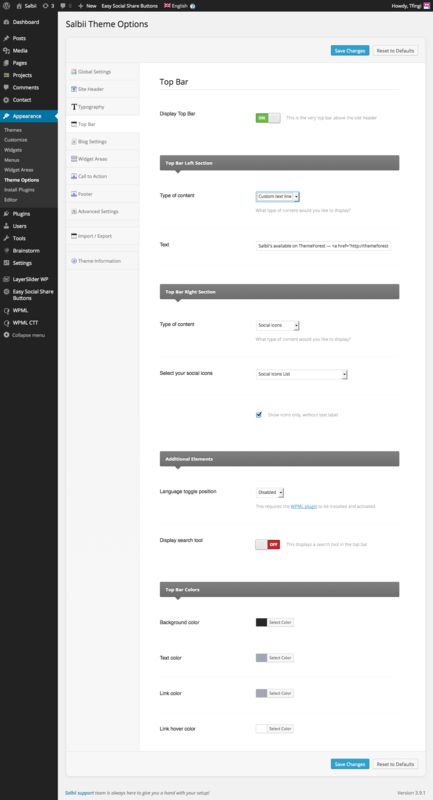 In your WordPress backend, navigate to Appearance > Theme Options > Theme Information and compare your theme version number to the version available on ThemeForest. If these are different, please update to the latest version. You can also read the changelog for each update, to see what Fixes, Improvements and New Features have been added. Ensure all your plugins are installed, updated and activated. In your WordPress backend, navigate to Appearance > Install Plugins and Install, Update and Activate all the plugins. If Install Plugins is not in your side menu, your plugins are already up to date and activated. Check through our Known Issues list to see if we are already aware of the issue. Please submit a support ticket with an explanation of how to recreate the issue. Screenshots and WordPress access will also help our support team to debug the issue. Note: If you have made any customisation to the core theme files, these will be overwritten when updating. Your demo content may be failing due to your server upload limit. It is recommended that you ask your hosting provider to increase your maxiumum upload limit to over 20 megabytes. If none of the above works, you will need to contact your hosting company for help. Some servers do not allow you to edit the server configurations locally as described above; therefore, if the warning message is still displaying, please contact your hosting providers to edit your settings. Nothing is wrong with your theme. This is a common issue that can occur with users new to installing WordPress themes and luckily there is an easy solution. A WordPress child theme is a theme that inherits the functionality of another theme, called the parent theme. 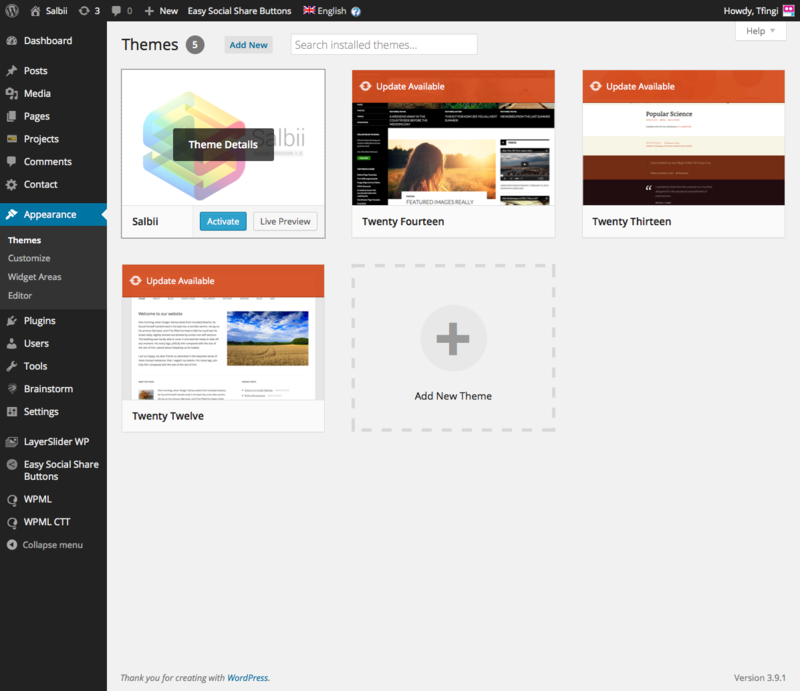 Having a child theme allows you to modify the core theme files, while keeping the parent theme intact. Without a child theme, any edits made to the theme files will be overwritten when updating the theme. But with a child theme, you can update your parent theme and your modifications and kept safe in the child theme. The child theme can override any file in the parent Salbii theme: simply include a file of the same name and replicate the file location in the child theme directory, and it will override the equivalent file in the parent Salbii directory when your site loads. For further information about child themes, visit the WordPress Codex.